We all have those things that we love deep down in our hearts but are somewhat embarrassed to admit in public. The Monday Listicles at Northwest Mommy is all about confessing our guilty pleasures. Here are some of mine. 1. Naptime – I love naptime, not for me, but the boys. From 1-3 p.m. every day I have time to myself with no one asking me for a snack or needing a toy put back together. Most of the time I work (like right now), but periodically I watch a movie or do my nails. 2. TV – We probably have the TV on too much in our house, but a two year old is just not a great conversationalist. It also allows me to catch up on the shows that I like but Jim doesn’t. 3. French Fries – I am not sure what it is about French fries, but they are so good. Some are definitely better than others, but you can’t go wrong with a potato strips cooked in hot oil. 4. Reality TV – I know this was probably called out above, but since I was confessing I felt the need to be more specific. As Jim says “There is nothing better than watching stupid people be stupid on TV.” Yes I (we, Jim loves them too) watch Bachelor Pad, Survivor, Amazing Race and Big Brother. Those are the ones I am willing to admit to in writing. 5. Uncle John’s Margaritas – Anyone who has been to my aunt and uncle’s lake house and had one of his fancy margaritas will agree they are just awesome. Even Jim likes them and he will not normally drink tequila. John makes them in big tumbler cups and then we either sit on the dock or go for a boat ride. Nothing says summer like Uncle John’s Margaritas. 6. 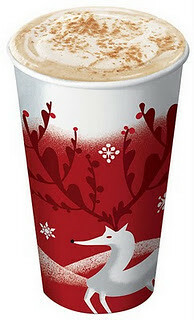 Eggnog Lattes – Jim and I count down the days until Starbucks has eggnog lattes for the holidays. I am not sure why this combo is so good, but it is. I have tried to recreate them at home, but they just aren’t the same. 7. Red Wine and S’mores by a Campfire – There is nothing better than sitting around the campfire (especially after Will goes to bed, noting a theme) and enjoying some good red wine, yummy smores and great friends. 8. Cheesecake – I love good cheesecake. Thank goodness I don’t eat it very often because I would weigh 300 pounds. It is so creamy and rich, especially pumpkin or s’mores. 9. Vests – I think I get this one from my Dad. They are so comfortable and give you just enough warmth. I have knit ones, fleece ones, down ones and I wear them all. 10. Pedicures – I have a hard time looking down at naked toe nails. I have no idea why, but it makes me happy to see brightly painted nails when I get out of the shower. Most of the time I just do them myself, but periodically it is such a nice indulgence to be able to go and have them done. What are your guilty pleasures? Are there some that you aren’t willing to admit even to strangers? Red wine by the campfire is a great one! I almost forgot how enjoyable it is! Cheesecakes and vests-we were practically separated at birth! Great list. I love Survivor and The Amazing Race too…and others I won’t admit. Now I really want to find a campfire and consume some wine and s’mores.